The escalating conflict in South Sudan had driven more than a million children out of the country, the United Nations said warning the future of a generation is “on the brink”. “The horrifying fact that nearly one in five children in South Sudan has been forced to flee their homes shows just how devastating this conflict has been for the country’s most vulnerable,” said Leila Pakkala, the Regional Director for Eastern and Southern Africa of the UN Children’s Fund (UNICEF), in a joint statement with the UN refugee agency. “Add this to the more than a million children who are also displaced in South Sudan and the future of a generation is truly on the brink,” she warned. Children make up 62% of more than 1,8 million refugees from South Sudan, according to latest UN figures. 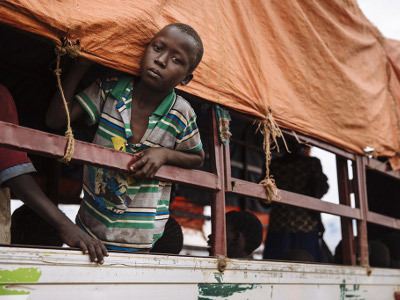 More than 75,000 refugee children in Uganda, Kenya, Ethiopia, Sudan and the Democratic Republic of the Congo(DRC) have crossed South Sudan’s borders either unaccompanied or separated from their families. “No refugee crisis today worries me more than South Sudan,” said Valentin Tapsoba, the Africa Bureau Director of the Office of the UN High Commissioner for Refugees (UNHCR). South Sudan has the highest proportion of out-of-school children in the world at about 75%. The trauma, physical upheaval, fear and stress experienced by so many children account for just part of toll the crisis is exacting. Children remain at risk of recruitment by armed forces and groups. With traditional social structures damaged, they are also increasingly vulnerable to violence, sexual abuse and exploitation. UNICEF’s appeal of $181 million for South Sudan and South Sudanese refugees in the region for the rest of the year is currently just over half funded while UNHCR’s funding appeal of $ 781.8 million for the country is only 11% funded.